The immediately striking thing about Poverty: The Forgotten Englishmen is that it was first published in 1970 then reprinted in 1973 with an added introduction lamenting how little had changed over the intervening years. Reading it now in 2017 what is immediately striking is how still very little has changed. The landscape has been renovated, of course; from the cities, the towns, the suburbs and the estates but this has not been accompanied by any noticeable human advance among the poor. Throughout the whole of the UK the poor are still with us, and even though they might now be fortified by consumer goods and living in houses considerably better than those of the past, their problems still remain. Material advances in living conditions have been negated by eternal economic uncertainty and the sheer cost of being able to simply function in society. In real human terms, it could be said that poverty has become even more severe, deprivation even more manifest, and hope even more elusive. There was once a fashion of blaming poverty upon the individual, that it was their shiftlessness, low intelligence or their incapability to budget that led to their economic position. As poverty was mostly found among the working class, the blame was laid upon the so-called 'problem family', or the 'multi-problem' family, even. There are still some, of course, who hold this opinion, particularly those of a conservative bent though nowadays it is more widely accepted that the problem of poverty is actually rooted in the economic and class structure of society. Poverty, it could be said, is an inevitable if not intentional result of economics and a cornerstone on which the whole class system is built. According to Bono of U2, that well-known defender of the poor and the oppressed, in the eyes of those who live hand-to-mouth there is no difference between the wealth of a white collar worker and Bono's own vast wealth. Meaning, both the white collar worker and Bono can eat well, can afford medicines, have time off, and don't have to worry about their children. This, however, is a very one-dimensional if not very wrong interpretation of what poverty is. It's an interpretation used and cited not as a way to help the poor in any way but to defend and justify the privileged. Poverty is absolute and poverty is relative. There is no defining poverty line that can be drawn though many still to this day insist upon one. Poverty doesn't just mean to be without the essentials of life such as food, heat, water and shelter. If you have these essentials, for example, but then can't afford the bus ride to get to work to pay for them, where does that leave you? In poverty. If you can afford the bus ride but then once after paying for the essentials you can't afford other necessities as determined by the society you live such as laundry, cosmetics, hair-dressing, clothes, etc, etc, where does that leave you? In poverty. Being unable to function properly in the society you live due to the economic position you're in inevitably means a lack of power as compared to that held by the more privileged. Which is the point at which Marx comes in: "If the income of the worker increases with the rapid growth of capital, the social gulf that separates the workers from the capitalists increases at the same time," as Marx pointed out "The power of capital over labour and the dependence of labour on capital increases at the same time." So, if in a capitalist system poverty means loss of power, this not only means that people are in want but that they're also ill-placed to complain effectively about their condition. Which is the point at which the likes of Bono steps in to speak up on behalf of them - or some of them at least. 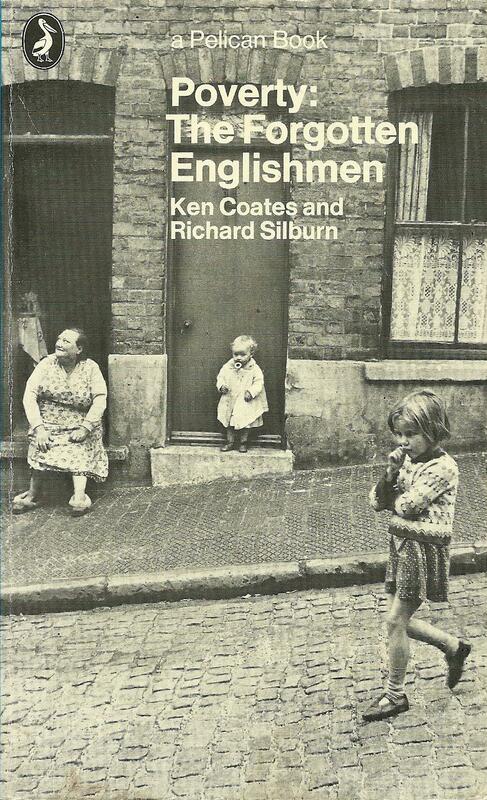 There are a lot of important, thought-provoking ideas raised by the authors Ken Coates and Richard Silburn in this book, and whilst their study is focussed upon the St Ann's area of Nottingham, what comes out of it is just as relevant to any other part of the country where poverty flourishes. One of the most important things to be said about poverty, they declare, is that the main cause of it is not indolence, nor fecundity, nor sickness, nor even unemployment, nor villainy of any kind but is, quite simply, low wages. Is there a culture of poverty, they ask? The answer is a most definite 'Yes', one aspect of that culture being acquiescence with the normalization of poverty. The normality of poverty? Is it really normal to be poor? Is it right for the poor to just accept their lot? Is it normal and right that some are rich at the expense of others? Do they not owe us a living, as the saying goes? Which all leads to the most salient point in the book, that being when the authors talk about those who draw their influence and power from a willingness to impose poverty and the normalization of it on others. Which is the point at which - for the reader - anger comes into it. Or it should. And if it doesn't then it would suggest just how deeply and comfortably the acquiescence has actually sunk in to us all.